Category: Furniture inlays. UC58838. Ivory (?) 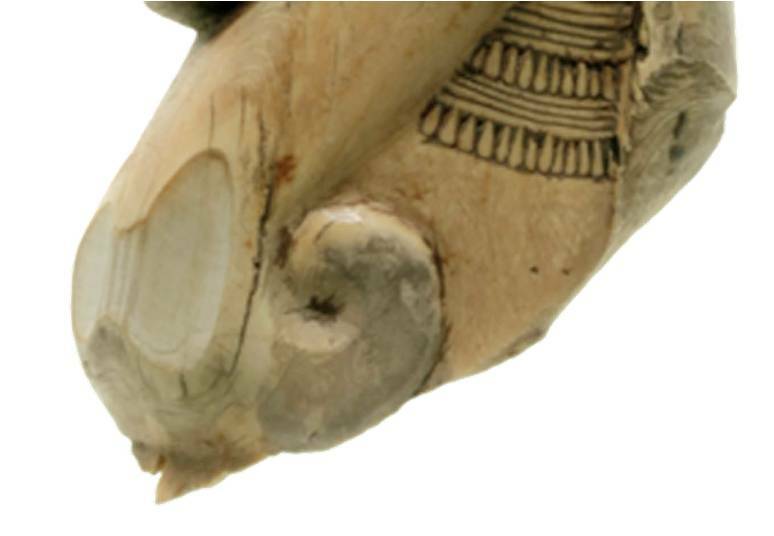 profile head of woman or goddess, with striated wig, flat-backed (inlay? ); much shattered. Period: New Kingdom. Two ivory busts, flat at the back; probably from the sloping legs of folding stools. XXth dynasty? 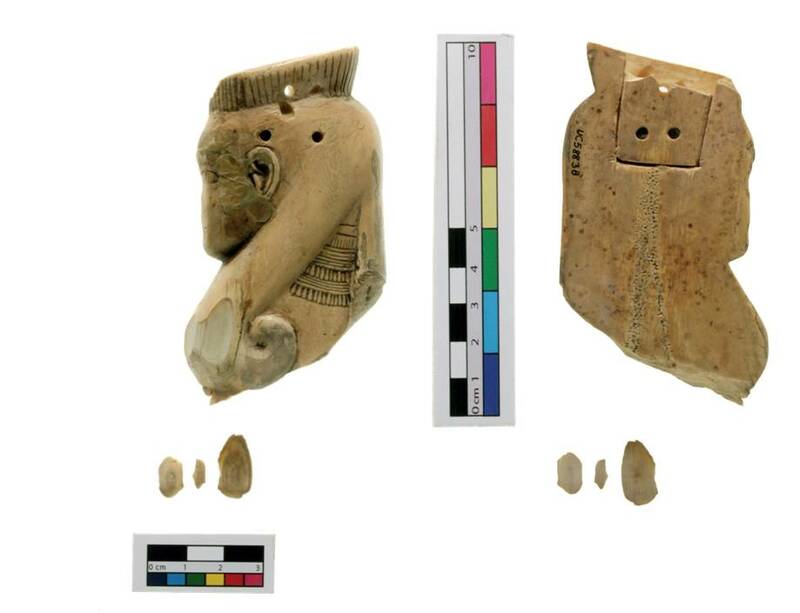 The object is only dated stylistically, nothing being known of its archaeological provenance. Most of the surface of the object was in good condition, with no flaking or cracking. Three fragments had split off the object from the front lower left, possibly from a knock. The break edges were clean and the fragments fit precisely back onto the object. Next to these missing areas were two large cracks, one on each side, and several smaller cracks. The cracks are visible in the catalogue photograph from 1927 and thus have been present and unchanged for almost a hundred years, so they probably pose little risk to the object if it remains in stable conditions. An area on the face in front of the ear was covered in discoloured and flaky wax. The objects in the Petrie were packed hurriedly for safe storage during the Second World War, it is possible that this wax made its way onto the object at this time. There were further waxy areas on the section of hair that falls down the figure’s back. These had also become discoloured. It was thought that these may be wax fills that had been applied since the catalogue was compiled; wax has commonly been used as a fill in conservation. There were grey deposits on the surface of the object around the wax fills at the back of the hair, and across the curl of the hair at the bottom, and lightly across much of the surface of the object, and across most of the back. These do not seem to be present in the 1927 photo and can be assumed to be a later change to the object. The treatment initially aimed at reattaching the fragments and investigating the wax, but after it became apparent that the wax was superfluous, it was decided to remove it. The waxy areas on the front of the object, especially the one over the face, were aesthetically displeasing, and it was suspected that they were serving no function. The grey deposits were also aesthetically unappealing. If these could be removed while putting the object at no risk, that was considered to be a good outcome. Several solvents were tested on the surface; the only ones found to remove the grey deposits and other dirt were de-ionised water and 2% amylase solution. While cleaning, it was observed that the amylase solution softened the wax, thus all of the wax areas, and the grey deposits, were removed using the amylase solution on cotton swabs (see left). The whole object was then lightly swabbed with deionised water to remove any amylase residue. The fragments were applied to the object using 50% w/v Paraloid B72 (a methyl methacrylate copolymer) in acetone. This adhesive was chosen due to its good ageing properties and reversibility, and was the first choice of the owner. The object is now much more pleasing to look at, and no damage was caused during the removal of the wax and grey deposit. The fragments have fitted on very well and are secure. The adhesive used has good ageing properties, so these joins should be stable for a long time. The object is stable and can be handled (with care!). 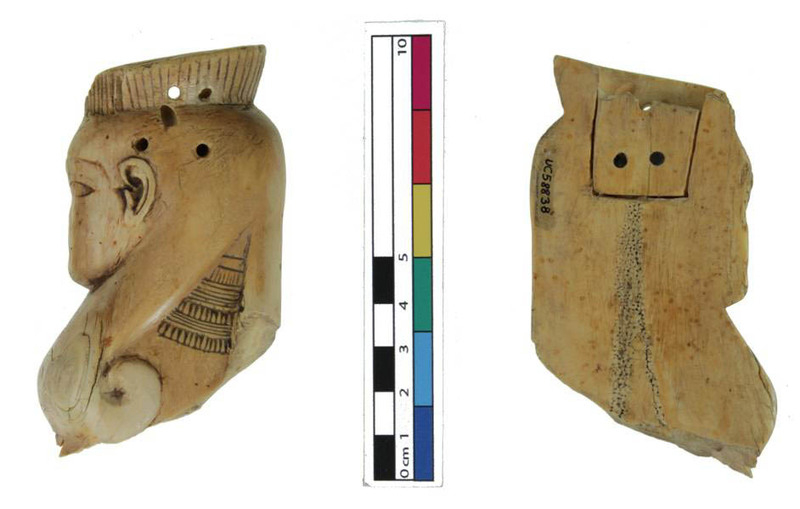 The object is now stable, but ivory is always at risk of damage, especially from changes in its environment. The relative humidity should be kept stable because ivory is hygroscopic and anisotropic, so can easily be damaged by fluctuations in humidity. No damage has occurred to it since it entered the museum (excepting the wax deposits), so the object has probably adapted to the conditions in the museum. Ivory is sensitive to light, so should be kept at below 150 lux and UV limited to 75 μW/lumen. The object is safe to be handled, but gloves should be worn to protect it from sweat and oil from hands. Ivory can be affected by gases given off by some inappropriate storage materials, including rubber and urethane foam. Where possible it should be kept in storage facilities that have been made to conservation requirements.